Inside many of us there´s a nagging feeling of another life waiting to be lived – the life we were meant to live. At Ferratum, we aim to bridge the gap between the life you dream and the life you lead, to help dreams become a reality, and to make the impossible, possible. Back in December, we ran a contest called Outdo Yourself. To enter, we asked you to send in a video pitch about a project or goal that was dear to you, be it a dream profession, a long sought-after desire, or other endeavour you hoped to realise. Perhaps it was something you already started or something you’ve always wanted to do but hadn´t had the time or resources to complete it. Or perhaps you just needed encouragement to pursue your dreams. Outdo Yourself was created to empower and encourage you to put your ideas into action, an opportunity to complete your resolutions for 2018, and to do the things in life you perhaps put off doing in the past. In turn, we, at Ferratum, offered a generous grant along with the mentorship you need to help you to achieve your goals. See, at Ferratum, we understand that money can create opportunities and can open doors that lead to more opportunities. That´s why we created our products as tools to aid you in your pursuits, help you reach your goals, and enable you to say yes to life more often. We were overwhelmed by the number of wonderful videos we received - 133 videos from 18 different countries to be exact - and it was an extremely difficult task selecting just three winners. However, after the winners were announced at the end of January, we soon realised that the videos themselves had the power and messaging to inspire many more people long after the contest had finished. One of the most heartfelt videos we received, and subsequently one of our three winners, came from Estonia. The video tells of a girl named Liisa-Lotta who has the dream of fulfilling her grandfather´s dream of travelling to the South African coastal city of Cape Town. Liisa-Lotta shares how important her grandfather has been not only to her life but her entire family. Sadly, her grandfather is unable to travel due to his deteriorating health. Instead, Liisa-Lotta promised him she would achieve his dream by travelling to Cape Town for him. 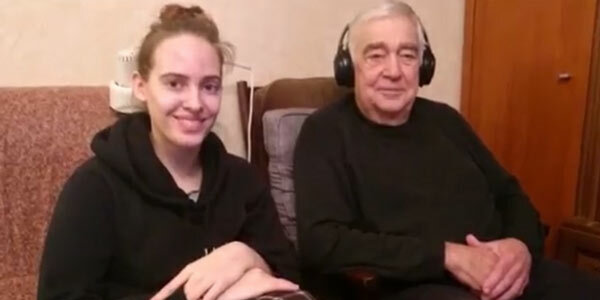 We love this video because it works three-fold; we, at Ferratum, are proud to have empowered Liisa-Lotta to make her dream come true which, in turn, helped make her grandfather´s dream come true. The video reminds us of the importance of family, letting our families know how much they mean to you, and that happiness is often found is making others happy. Stay tuned for more inspiring stories from Outdo Yourself next month!